Robert Wintner is Snorkel Bob, and REEF LIBRE is his 4th reef photo book, the 1st from Rowman & Littlefield. He is still on the frontlines of the campaign to ban the aquarium trade around the world, because it’s all one reef. 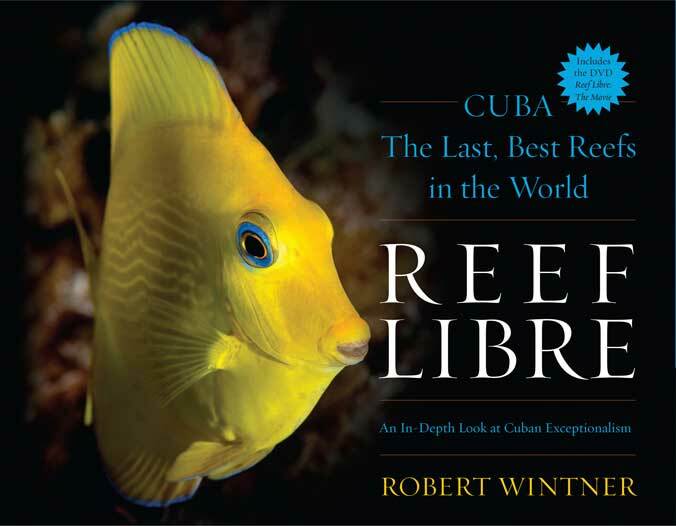 REEF LIBRE is not a travelogue but asks the big questions after a lifetime of isolation—can Cuba reefs still thrive? Nearly 400 stills, a compelling narrative and a DVD capture this delicate time in reef history. Reef Libre, the Movie, is a mini-documentary, capturing this pivotal time, from the streets to the reefs. Relative isolation, no U.S. tourism and marginal development or repair have rendered Cuba reefs pristine—the only reef system in the world with 100% biodiversity, 100% coral cover and a complete host of apex predators. Reef treasure surrounds the island nation’s poverty and stark reality. Robert Wintner’s photography reveals these reefs as never before, and captures equal color and innocence from the pastoral countryside to Havana Vieja. Reef Libre was on the cover of Publisher’s Weekly.